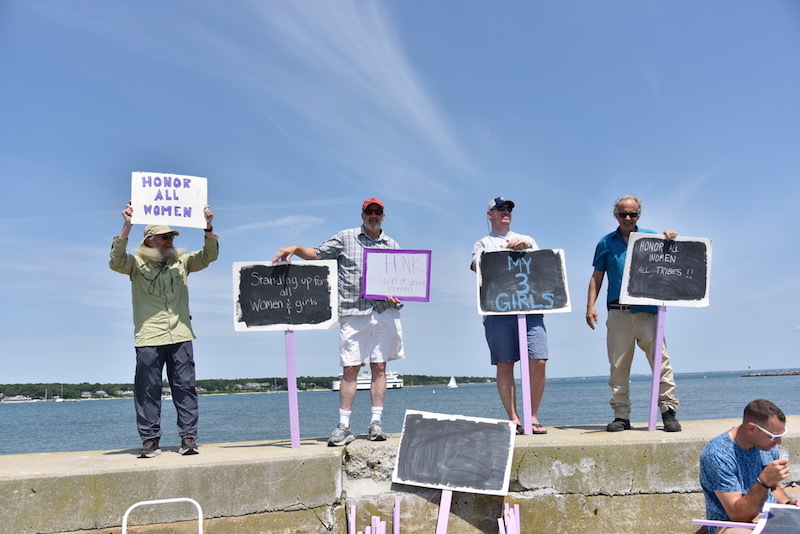 Island men joined seventh annual demonstration against domestic violence Saturday morning on the sea wall in Vineyard Haven. 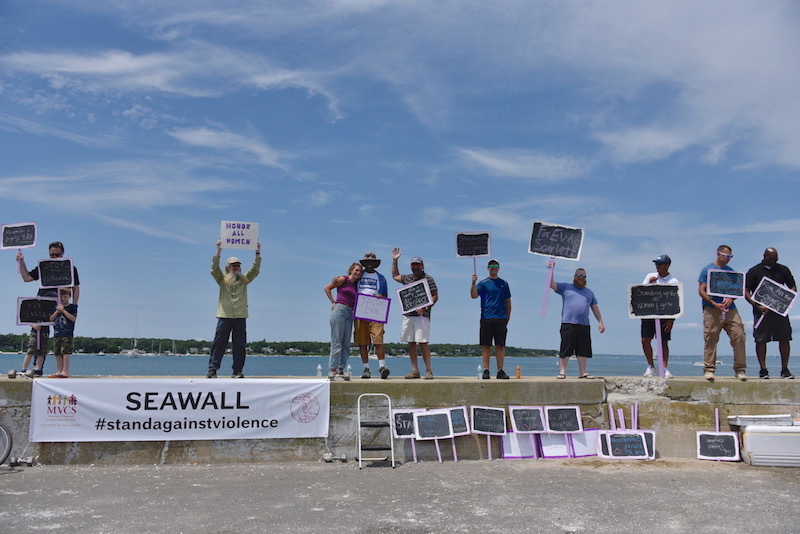 Island men stood tall on the Beach Road sea wall in Vineyard Haven Saturday morning for the seventh annual demonstration against domestic violence. He said men need to be able to stand up to other men to stop the culture of violence, even in situations where the negative effects of a comment or a joke aren’t obvious. “We need to get men together to find the courage to say hey, knock it off,” he said. The sea wall was lined with pickup trucks and at least one motorcycle. Members of Island law enforcement joined the demonstration, including Aquinnah police chief Randhi Belain and Sterling Bishop who works for the Dukes County Sheriff’s Department. West Tisbury police Sgt. Garrison Vieira is part of Island law enforcement’s domestic violence team. Barney Zeitz stood nearby with a sign reading, “Honor all women all tribes!” He said he was inspired by his daughter, Kaela Vecchia-Zeitz, to join the event two years ago. Kaela founded the anti-sexual violence student group at the high school as part of her senior project. Mr. Zeitz wore a black CONNECT bracelet. “I got this bracelet last year and I never took it off,” he said. More pictures from the demonstration. “This is the one time I’ve been happy to see a slow-down of traffic after the bridge,” he said. Cars honked as they drove by. State Rep. Dylan Fernandes, Democratic candidate for lieutenant governor Quentin Palfrey, county sheriff Bob Odgen, register of deeds Paulo DeOliveira and superior court clerk candidate Charles Morano also joined the demonstration. Connect to End Violence program director Jennifer Neary said it was moving to see men take a stand. 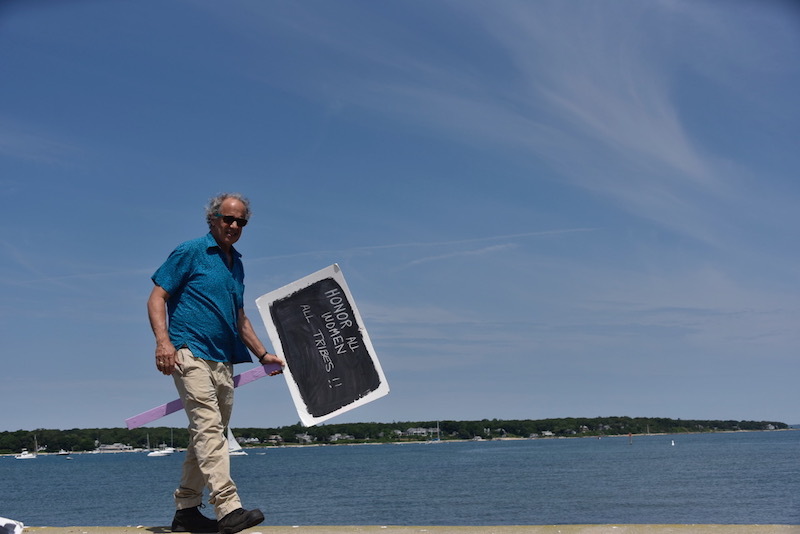 She said the Island group, Men Opposing Violence Everywhere on Martha’s Vineyard (MOVE) works with CONNECT to promote dialogue among men about the issue. “We’re very lucky to have the community we do,” she said. Thank you to the men and women who marched. Bless these men and women.